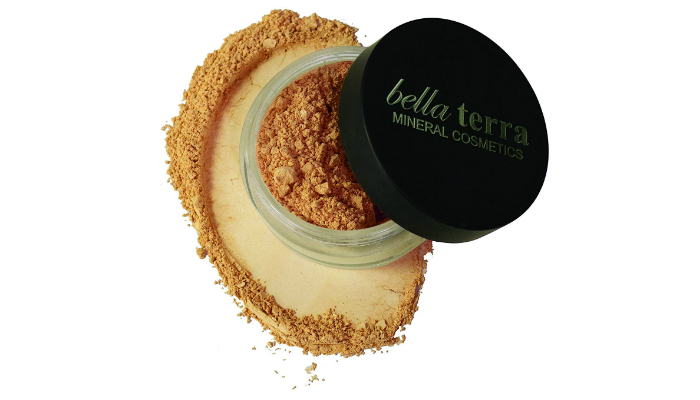 Guaranteed to stay on the topmost layer of your skin, Bella Terra Mineral Powder Foundation won’t get into the gaps of wrinkles and fine lines. That’s why it can conceal any sign of aging skin. 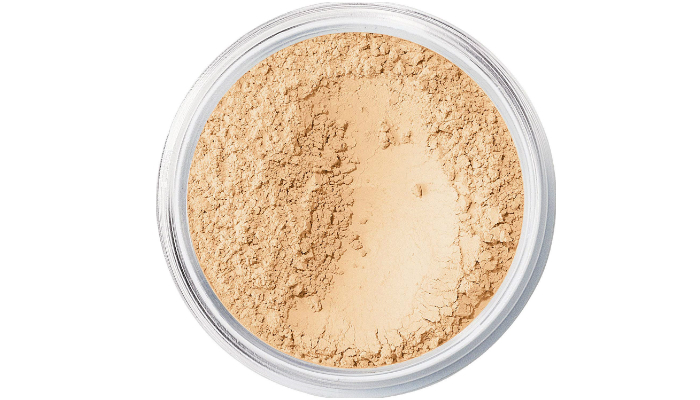 Since this makeup foundation is technically mineral powder, it has a clear finish despite its color. It will perfectly cover your face as a concealer and undereye corrector without giving a fake look. Your skin will still have a natural appearance. When it comes to comfort, you won’t feel this powder sitting on your skin all day. It is so lightweight that you’ll feel more confident facing anyone. Aside from the beautiful finish and comfortable feel, this foundation also provides the benefits of an SPF 15 sunscreen. It can protect your skin from harmful ultraviolet (UV) rays. In fact, it is somehow better than sunscreen because it will never get sticky, leave residues, and overpower your nose with a strong scent. Powder foundation for mature skin shouldn’t just focus on concealing fine lines, wrinkles, and dark spots. It should also be nourishing. 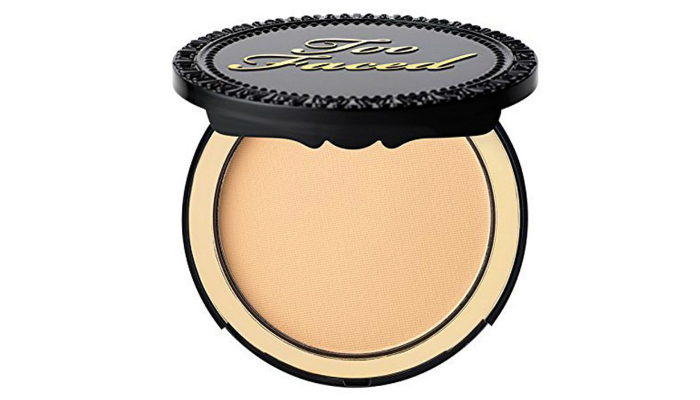 In particular, Too Faced Cocoa Powder Foundation is packed with antioxidants any skin type needs. This product is also an excellent moisturizer. It won’t make your skin dry for hours. Despite locking in a good amount of moisture, it can also absorb excess oil for a stunning matte finish. Whether you’re planning for full or medium coverage, this powder foundation can help you achieve it flawlessly. 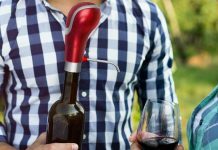 It can be one of the most versatile products you’ll ever own. 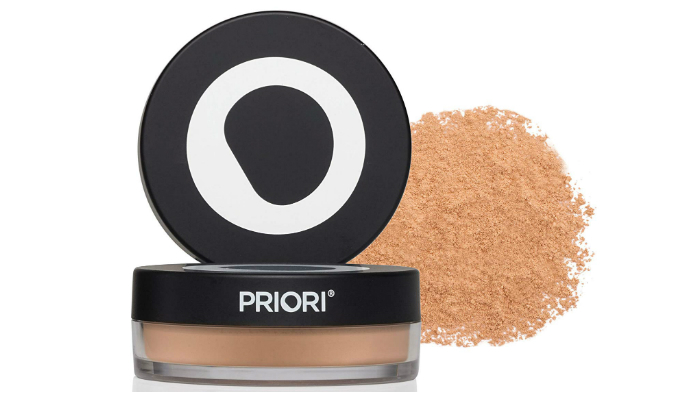 If you’re dealing with a serious combination of mature sensitive skin, uneven tone, and acne, Priori SPF25 Mineral Powder Foundation is a very effective option. That’s because it’s purely made of natural minerals. It doesn’t contain water, preservatives, and chemicals. Regarding the actual ingredients, this product contains 30 antioxidants and polyphenols. No wonder it can protect your skin all day from environmental factors like UV rays. In case of inevitable damage, this foundation will just repair your cells fast. Since powder foundations with extra benefits can be expensive, we made sure that the last product is significantly cheaper than the rest. However, bareMinerals Original Foundation is still a force to be reckoned with. It is technically powder but surprisingly creamy when touched. The creaminess of this product is the main reason why it’s a good concealer and moisturizer. Even better, it has a silky aftereffect for a more natural look. Before we proceed any further, aren’t you curious what’s so good about mineral powder compared to other types of loose powders? Is it even better than pressed powder? First things first, mineral powder literally contains minerals like titanium dioxide, zinc oxide, iron oxides, and simply – talc. According to WebMD, the minerals are micronized, ground, or milled to turn them into fine particles. Now, let’s discuss the advantages and disadvantages of mineral powder foundation. The obvious benefit is the transparent or clear finish of mineral powder because of its tiny particles. 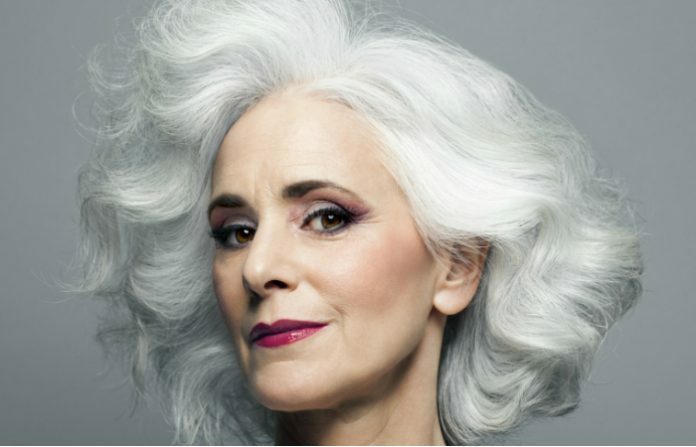 With the right techniques, signs of skin aging are perfectly concealed while preventing a cakey foundation. On the other hand, regular loose powder and pressed powder have the tendency to sit on your wrinkles because of their heavy texture. Unfortunately, a mineral powder alone won’t stay long on your skin. You should apply other products like primers to make the particles stick. And worse, you might have a hard time looking for the right shade. Unlike pressed powders and liquid foundation, the range of choices for the mineral type is very limited. The product we’ve chosen as the best powder foundation for mature skin is clearly not the type most people are used to. While pressed powder is the typical version, our number one choice is classified as a loose mineral powder. Moisturize your skin with products like serums and sunscreens. Use an anti-aging eye cream to conceal dark circles while nourishing your skin. Gently blend the eye cream with your fingers. Only use a limited amount of mineral foundation to prevent having a cakey face. To compensate for the small amount of mineral foundation, use a tinted primer before application. Apply tinted primer without any hassle by dotting necessary sections first, especially the T-zone. Lightly rub or brush the tinted primer all over your face and neck. For mature skin with deep lines, especially near the eye bags and edges of the nose, apply highlighter to conceal them. To ensure a limited amount of highlighter, put a tiny dot on your hand and then use a really small brush to outline dark lines. Blend the highlighter with your fingers. Pour a bit of mineral powder on the container’s cap or cover. Use a kabuki brush for a wider coverage without the need for additional pressure. Swirl the brush all over the powder you prepared. Remove excess powder by tapping the brush on the cap, which brings some powder back into the cover. Pat the brush on important sections first – again, the T-zone. Spread the powder all over your face, ears, and neck with the same brush. Add more powder if necessary. Use a setting spray for a more natural look. Pressing foundation on fine lines and wrinkles seems like a bad idea. That’s why we recommend a loose mineral powder as the best powder foundation for mature skin. In particular, Bella Terra Mineral Powder Foundation stands out because of its transparent finish and added sun protection factor (SPF). Sometimes, it’s easier to apply liquid foundation. If you want zero powder on your face, we have some tips you might appreciate. Find out how to set a makeup foundation without powder.